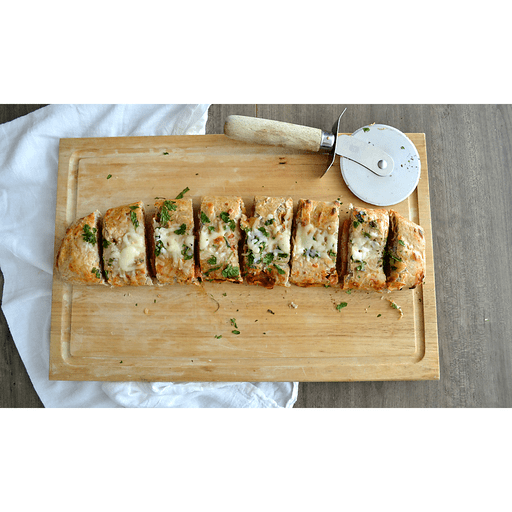 Cheesy, meaty goodness in one fun stromboli! 1. Preheat oven to 400°F. 1. Spray a baking sheet with cooking spray. Roll the dough out and stretch it out on the prepared baking sheet into a large rectangle. Spread the pizza sauce evenly on the dough, leaving about 2 inches from the edge. Top with salami, pepperoni and 1 cup cheese. 1. Roll up the dough lengthwise and pinch the edges to seal and fold at the seam. Lay the Stromboli seam-side down. Brush with the beaten egg and cut small slits in the top. Top with ¼ cup cheese and sprinkle with parsley. 1. Bake for 15–20 minutes or until golden brown on top. Serve with warm pizza sauce. Calories 240, Total Fat 10g (Saturated 4g, Trans 0g), Cholesterol 50mg, Sodium 670mg, Total Carbohydrate 26g (Dietary Fiber 2g, Sugars 1g, Includes 0g Added Sugars), Protein 13g, Vitamin D 0%, Calcium 10%, Iron 10%, Potassium 6% *Nutritional values are an approximation. Actual nutritional values may vary due to preparation techniques, variations related to suppliers, regional and seasonal differences, or rounding.